I am not a second-class citizen in the kingdom of God! With regards to the report on this year's Territorial Congress in Glasgow. You mention in the report that "Commissioner Banks led an extended time of prayer for officers, cadets and those called by God." 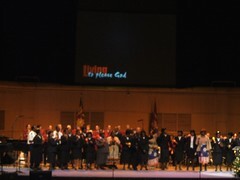 May I point out that the people "called by God" were called to Officership. At no time did Commissioner Banks extend the prayer time to people, like me, who acknowledge their calling in the Army but are not called to Officership. I was hurt by this as I work hard in my Corps and in my Division... as well as in my community... for God and for the Army without a Rank or Badge. I pan my guts out and I am not looking for thanks but would have appreciated some prayer. All Commissioner Banks did was perpetuate the division of clergy and laity... which is nonsense as we are all called to serve... in the Priesthood of ALL believers. I am not alone in this opinion - a lot of "unbadged" were similarly offended by this clear division. ...you are the ones chosen by God, chosen for the high calling of priestly work, chosen to be a holy people, God's instruments to do his work and speak out for him, to tell others of the night-and-day difference he made for you—from nothing to something, from rejected to accepted. This verse isn't specific in that it doesn't focus on one group over another... Peter emphasizes the plural YOU. He doesn't say "some of you are this and some of you are that" > he says YOU. We are all God's instruments to do His work... We are all CALLED to be the salt and light in this world. This is why I was offended by the deliberate split of clergy [officers] and laity [everyone else] > I am called to serve my Lord and my neighbour... but as I am not called to officership... I was excluded. Don't get me wrong : Officers > Candidates > those called to Officership : need our prayers but so do the ordinary folk... the common man or woman who works for God wherever he/she is placed > the common man or woman who brings a wee bit light into the darkness > who demonstrates the love of Jesus and the Kingdom of God right where he/she is. Where were the prayers for folk like me? Who is on the frontline in the spiritual war? The high-ranking church "official"... or... the Officer on the street with the homeless person... or... the student at University faced with temptation wherever she looks... or... the business man trying to bring a wee bit of the Kingdom of God to his open-plan office..? The answer is ALL OF THEM > why then single the "professionals" out for special attention? If you want a passive congregation... then continue to promote this split > maintain the status quo. Afterall, you reap what you sow. If you want a proactive and passionate congregation... a people who do not need permission... then remove this split > do not perpetuate this split any longer and reject the status quo. We are all Jock Tam's son's bairns! We are all created in the likeness of God... and are ALL called to His service to do His work and speak out for Him. I would welcome comments from my friends who are Officers, Candidates or just common folk who roll their sleeves up and reject the status quo. 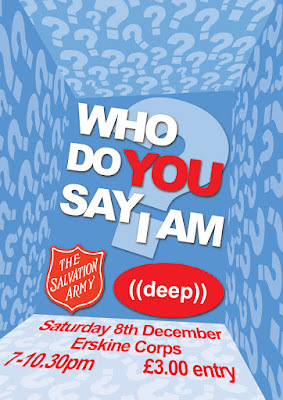 The next ((deep)) will be on the 8th of December at the Erskine Salvation Army [couldn't get the City Centre Corps]. DJ Michael "the Ninja" Jessop will be dropping some fab, soulful beats too... to get things moving... with Paul & Jen Clement leading worship with the Essential Band. There will an opportunity to quiz Gary... with DYO Iain Stuart interviewing him "on the couch". There will also be an opportunity to pray and converse with friends and likeminded people. Coffee and refreshments will be available throughout the evening > grab a coffee and make a new friend! Door tax is £3... with all funds raised being reinvested into the project. Thanks for your support... and even if you can't be there in person... keep us in your thoughts and prayers > this is for Him. If you blog... grab the flyer and post it on your own. Get the word out. We are considering putting on some transport... let Iain or myself know if you need a lift. Let's get prepared to celebrate the birthday of the King [of Kings]. 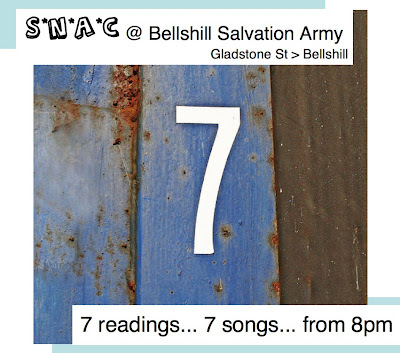 Come for around 8pm... coffee and mince pies will be served afterwards. Be there. I want to update slightly my recent blog post :: Some thoughts on consumerism and buying nothing :: with some further thoughts... hope you don't mind??? My Apple iBook is a 1.33ghz powerpc G4 - its a few years old and still going strong. Its running Leopard nicely and I don't feel the need to upgrade just yet. The DC Shoes [Uno model] were purchased in the TKMaxx in Inverness for £15. The baggy Levi's are 5 years old... and were a gift from Boyd for being the Usher at his wedding to the mighty Lorraine. The CK boxers were a vice of mine [want to look good for Olly] but I've gotten over it. The Goodmans speakers are more than 11 years old and were a gift. 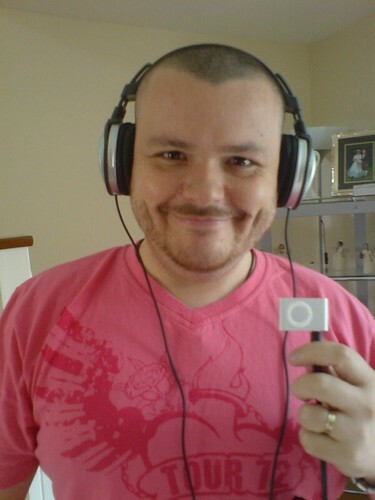 The iPod is a 80gb 5th gen that I bought last year in Philly for £60 less than I would have paid in the UK. The Casio G-Shock watch was a gift from Olly 5 years ago... and she assures me she got it discounted. Tetley's Tea - don't know how much one bag is. Donald Duck mug was free... I think. The Manhattan Portage bag was bought in TKMaxx in Inverness for £15 or so. My Moleskine notebook was a gift from Olly last Christmas. The Bic 4-colour pen was about £1... I think. In trying to think for myself, I seek to subvert the fashion industry > my favourite shop is TKMaxx > its a discount shop that sells "out-of-season" names. By refusing to buy "the latest thing" I do my bit to get out of the cynical cycles of the industry. In turn, by shopping in Charity Shops... I do my bit for the charity and continue to refuse to adhere to normative patterns of consumption. Think about it> shop local... shop discount... shop 2nd hand... these are ways we can have an impact. We don't need to pay full price for the latest thing. I cherish gifts... I love it when people spoil me with sweet stuff (remember - I am a consumer and I dig well designed kit). I appreciate the thought that goes into a gift and treasury what I am given. I acknowledge the fact that the gifts are an expression of love and caring... but I also appreciate the love regardless of the gift > the love transcends the gift. Sometimes the most important gift is time... or a text... or a coffee together. I realise this now... after all these years > its the thought thats the most precious. 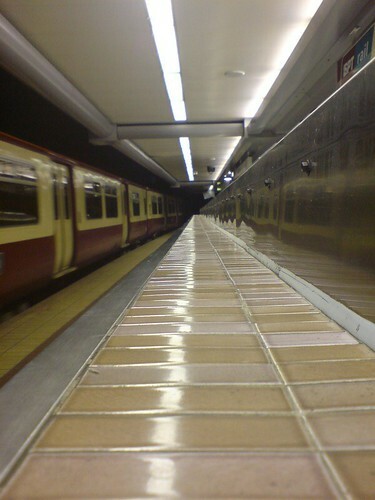 I also appreciate my surroundings... my place in creation... the urban space I work in and the suburban space I live in. 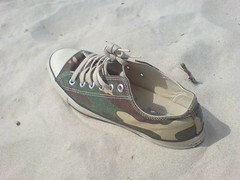 Its about walking barefoot in the sand... as much as it is about having a sweet pair of kicks. I have a responsibility as a husband, father and provider to pay the bills. Olly [thank God!!!] helps to pay for all the good stuff. As a result... I am careful with any money I have > I try to focus on what I need now... rather than what I want/desire/drool over. My hobby and my sport is music... listening to music... and that's my big thing. Even so... I am a big "bargain bin" raker > with some success, if I may be so bold. That said... I'd rather spend money on a coffee with a good friend. Stewardship [being careful with what we have] is important and something lost in the mess of consumerism. 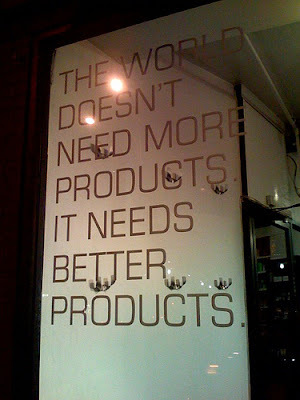 Stewardship says "you have what you need" when Consumerism says "buy more... more often!" Its about thinking before acting> Do I need this? Is it the best product for my money? Can I get it cheaper? Are their more suitable alternatives? Why do I want to buy this product? d) I don't judge a book by its cover... even though I can see how much it costs. I believe that God looks on the inside rather than the outside. To this end... whats inside is more important to me than my physical appearance. I might spot some nice product when I am out and about but I don't think anymore about that person other than "he's / she's got taste". Judging people by what we have or look like is wrong. This world places value on appearance > the gangrenous hierarchy of the rich and powerful is defined by its conspicuous greed and consumption. Reject this notion. It pervades our churches and gatherings > the very places that should be an oasis in this storm. What I have doesn't make me more or less anything > please judge me by actions, reactions and my choices. Do not judge me on what I have... or, more importantly, don't have. Afterall... Jesus was homeless! Think about it. 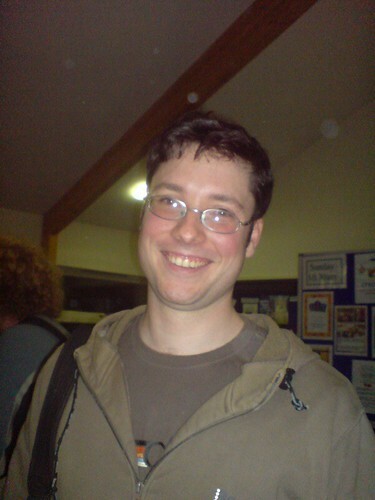 Another blogger who impresses me is a chap called David Seah :: he is a real GTD obsessive and... more importantly... guru who has produced some fab kit for keeping folk organised. * How many days are available, including weekends? * When are critical deliverables? * How much calendar time is needed to finish a task? * What are the specific days we have to work around? When I'm doing impromptu planning, I just circle dates and underline ranges, writing notes in the empty space on the right. It is basically a form of doodling your schedule. I find it's a great planning tool in meetings too; just whip out a few of these sheets out at a client meeting to do a quick thumbnail schedule on-the-spot. The days are all packed together visually, so "distance" corresponds directly to time. This makes visually estimating how much time you need much easier, an visual advantage shared with the Gantt chart. The calendar for an entire year can fit on a single piece of paper, with plenty of room for notes. You can also just print out a section of it, for short projects. It still largely retains the monthly calendar format, with days of the week in columns, so it's a bit easier to use than a Gantt chart. Saturdays and Sundays are shaded differently, so we are not as tempted to plan our work schedule on them. It's easy to count weeks too. "Unit weeks" tend to be the building blocks of longer-term projects. You're forced to break up project tasks to fit into each 5-day work period. Gantt charts, by comparison, tend to draw long lines through the weekend because that's what lines want to do. Even if you don't work on the weekend, from a visual perspective it seems to imply that you should be working. 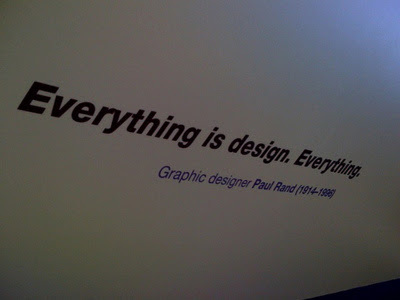 This has always bugged me, from the perspective of visual gestalt and information design. Because we retain the days of the week in the same column, it's easy to mark recurring events that are tied to them. "Oh, every Friday we have a company meeting." Easy to see where they'll be; not so on the Gantt chart. 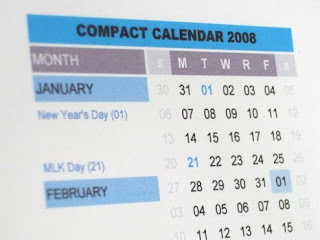 The main drawback of the Compact Calendar is that you can't easily show dependencies or overlapping tasks. It's also not so good for detailed planning. Anyway... I had a wee play around with his templates and created one for UK [English] Bank Holidays. I intend to use them at my work and thought I'd share them with anyone who would want/need this kind of thing. Download it here and check out David's blog [above] for instructions on use etc. He also has a wide selection from this big ol' world > including the USofA. Fixed the download link. Sorry for any hassle. Subversive bloggers are unsatisfied with the status quo, whether in church, politics, economics or any other power-laden institution, and they are searching for (and blogging about) what is new (or a "return to") - even though it may be labeled as sacrilege, dangerous, or subversive. 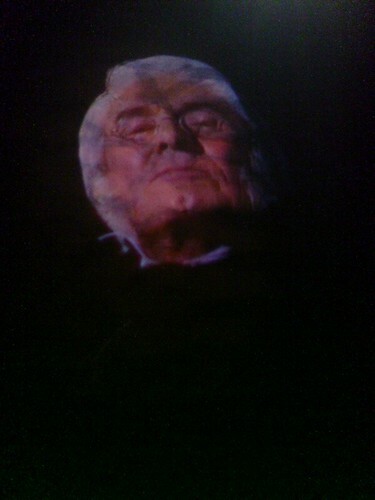 Pernell Goodyear > Truly inspirational bloke and Elton John fan. 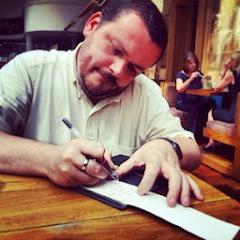 Johnny Laird > Another chap I am honoured to know... whose honesty is a daily encouragement. JD Blundell > I don't get the politics posts (He is American) but I get his enthusiasm... big time... and love the whole "Orange Noise Radio" thing. 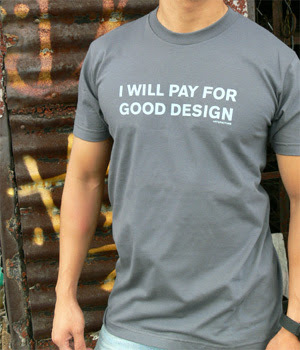 Matt Wilson > For keeping it real and getting his sleeves rolled up in Manchester and beyond. Royzoner > For truly off-the-wall visuals and being an all-round good egg. I probably could have made it 10 or more... and don't really want to offend anyone... Andy W, Laura B, Dan R, Chris H, Lloyd K, Adam H, Adele S, Ian McK, Brodie McG, Stewart C, Matt L, > you all inspire me too! That's all there is to it. 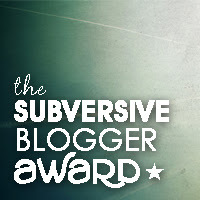 Keep in mind that this award is meant as an encouragement to bloggers to keep doing what they're already doing - being subversive (however you interpret it). May we never forget that Jesus (and His message) was the original and ultimate subversive. Take the image from the top of this post [courtesy of Josh Brown and Red Cowboy Designs] Download it but... please... upload it to your own server (Jake has another design on his blog). This word has been buzzing around my head for a wee while now... ever since I read about [its been out for a few weeks now]... and I have been thinking about the implications for this movement with the kind of church I dream of. 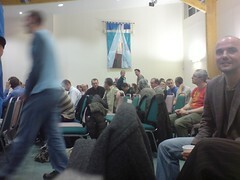 > Church [as a place we go] is essential to the well being and development of followers of Jesus. Fellowship expressed through the regular gathering and deliberate contact of like-minded people keeps us and maintains us... learning together... sharing together... serving together... worshiping together... praying together... This is community > intentional... incarnational and purposeful. > Mission [when the church looks outwards] is most effective when kept simple > building relationships & living out faith in the everyday situations that are presented to us. The Locavore concept highlights a growing trend that places emphasis and value on all things "local" > supporting the [physical] community in which you live > giving back to those who give > maintaining those who provide for us > defined within an almost symbiotic relationship. Church needs to be local. Our mission should be local > to the community [communities] that surround us and, in part, define us. 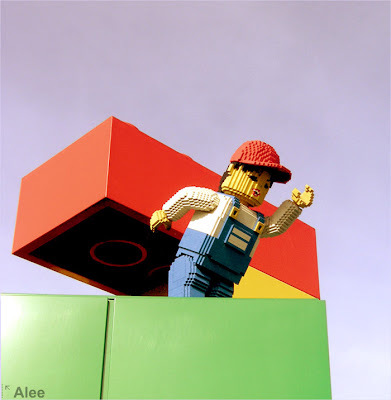 Local is inclusive not exclusive > We are the community > We are in our community but not of it. Local gives us shape and purpose... local provides clarity > community is defined in and with the term "local". Community is up close, familiar and personal... not distant, unfamiliar and impersonal. Let's keep church close and keep it local. 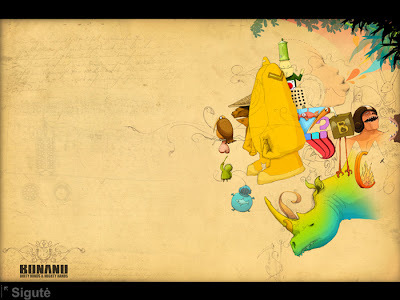 I use the website as a scrapbook for all the stuff I like... its a wishlist space for all the sweet sneakers and tees and stuff that I dig (but will never afford). Turns out my recommendations hit the spot and I am in the top 12% of users on the site >> hence Maven status. In the pack were branded M&Ms, some Parsley (because I have helped them grow), some cool stickers and a lined Moleskine pocket notebook. WOW!!! I was over-the-moon. I am halfway through my current Moleskine (plain pocket) and its fab to know there is a brand new one waiting for me. Anyway... as a thank you... I contacted Armand over at Moleskinerie to tell him of the Moleskine love (its the number one recommended product on ThisNext) and he featured the story. 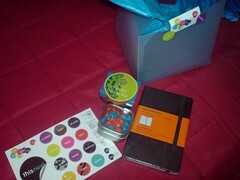 I know I am a big stationary geek... but it is cool to feature in a blog you read everyday. Nice. 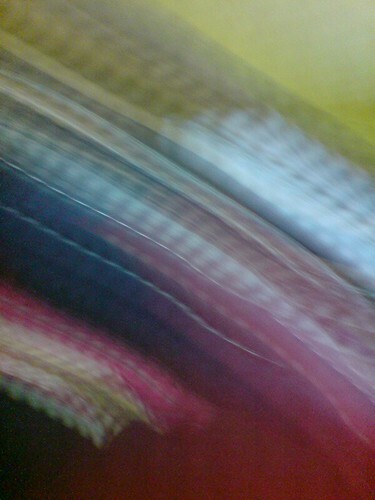 Is it just me... or is life a blur just now? I think it was Ferris Bueller who encourages us to stop and look around once in a while. Well... yesterday... I took his advice. Dayna and Miriam were off school for an in service day and Olly was working... so I took the day off to be dad. Got up at 0650hrs... and read in the bath. Trying to read the NT in a year... and am in 2nd Corinthians just now. I also read from Generous Orthodoxy and spent some time in contemplation... under the bubbles. 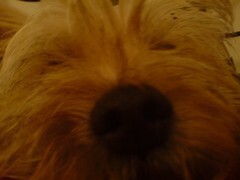 I love it when our Cairn Terrier is there when we wake up... and its even better when I wake her up! She doesn't like getting licked all over... but expects us to! Dogs, huh??? I made breakfast for Olly and then spent some time preparing my thought for Friday night coming... 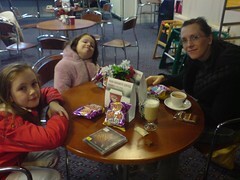 The Taylor Family are out and about... and token musically-inept member (me) has the thought. I love it really. We headed out before 1000hrs to go to the Heritage Centre - Olly hadn't been to the Techopolis and wanted to see the Techopolis. 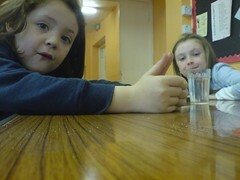 While we were there we checked out their current exhibit on the "big houses" in Lanarkshire. It was great to see the Cambusnethan Priory as a house and not as the ruins we are familiar with. Afterwards... we headed over to the Library for a coffee and to pick up some new music. The Fray, Norah Jones and Radiohead all came home with me [more on them later]. I dropped Olly off at her work... and dropped the kids off at Olly's mums and braved the multistory carpark in Hamilton to go to the Dentist. Fourth and last appointment... 2 more fillings (yes... I know... terrible!) Its weird to be known by name at your dentist's but I am... and its a nice feeling. Picked up the girls and headed over to Olly's work. I wanted to experience the Lunch Club for myself... I missed the regulars but got to hang with Isobel for a wee while. 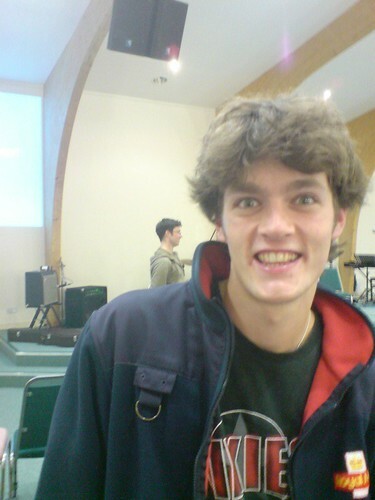 I am jealous of Olly. She has a job she loves... and she always comes home with a story. The Lunch Club serves the needs of a small group of mainly elderly men who get a 3 course meal and, more importantly, some company for £2 per day. The food was nice... I have to say that or she'll kill me... That or Isobel will get me. Lentil soup RAWKS!!! and the girls had fun on the old Cash Register in the Kitchen. 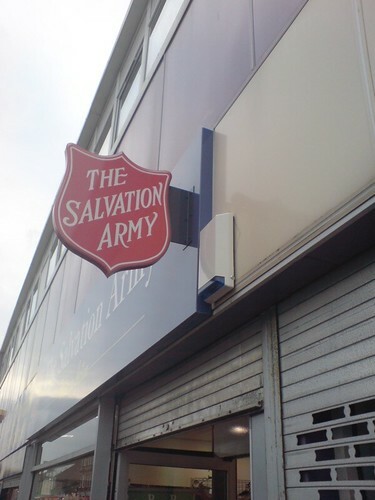 I killed some time with girls in the Salvation Army's Charity Shop. I love that shop. Picked up a Michael Palin book and Now by Maxwell for £2... all in! Nice! Headed home with Olly for a relaxing evening... time on the iBook (check out my tumblr space for some ideas of where I've surfed...) and time with my parents, who popped through. Olly wasn't feeling so good later on... so I ended up going out with my dad to pick up tablets >> had a great blether and catch up. After they left... I watched an episode of Michael Palin's trip Full Circle on the iBook (borrowed for free from the Library)... on the sofa... and then in bed. It was a nearly perfect day... if Olly was feeling better... or was, in fact, off work... it would have been perfect. It just shows you don't need to spend loads of money to have a great time. Support your local Libraries and Museums. Support your local charity shops and community initiatives. Its true about making hay while the sun shines... Get out there... Live life. If you don't... you might just miss something worthwhile. 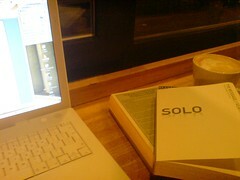 Time alone with Olly... with coffee! Time on the couch watching Harry Potter and the Order of the Phoenix with Olly and the we'ans. Time with friends in Glenrothes... as three important kids :: Rachel, Calum & Sarah :: from the Drama Group were enrolled as junior soldiers. This was important for me... and for Olly... as we caught a glimpse of church as it is meant to be. Time with my parents... watching them play with the we'ans... freeing Olly and I to have some time alone. Time with my church... on duty... at another church. Singing the praises of our Lord. Time with friends at a gathering... having a laugh over a spiced chai latte... after work. Time in the bath... reading my Bible... reading a generous orthodoxy by Brian McLaren... resting from the busy-ness. Time at work listening to Aphex Twin, Adrian Carter, The War of the Worlds, Regina Spektor... to name but a few. I love this freedom. Its important for me to reflect... to look back at all the things that have contributed to my life... and that's why I will not let the ol' nanolog go. Blogging... taking pictures... being part of online culture... is important to me. Contemplation comes through looking back... and looking, in detail, at the subject matter. The nanolog is an outlet... my expression... of my gratitude to my Lord. Being part is... for me... about representation. I am a follower of Jesus wherever I go... regardless of whether I am online or in the world. I figure I have to be in this online world too... although I am not... or at least try not to be... of either. So... what's this all got to do with the photo above? Well I snapped this pic while walking to work. I felt it was relevant to where I am, at the moment. 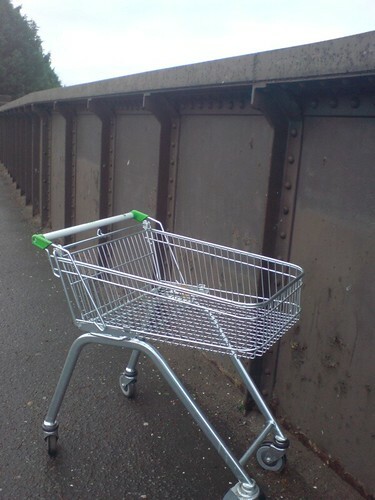 I am the trolley... I know my purpose and I am willing to serve... as and when needed... to carry grouceries to the car etc. But the thing is... I am out of context. I am away from that which gives me context - the supermarket... and yet I still have purpose. My purpose hasn't changed but the context in which I exercise my purpose has. This leads me to a realisation... I am defined by my purpose and not by my context. the dead... the injured... the hurt. the humiliated... the raped... the tortured. sons and daughters without fathers and mothers. war affects the soul... not just the soldier. there are not victors in war... only victims. the dead on both sides... the injured on both sides... the hurt on both sides. the humiliated on both sides... the raped on both sides... the tortured on both sides. 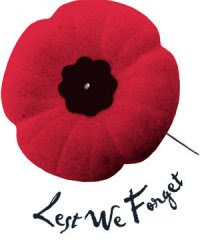 Don't forget... today and everyday. 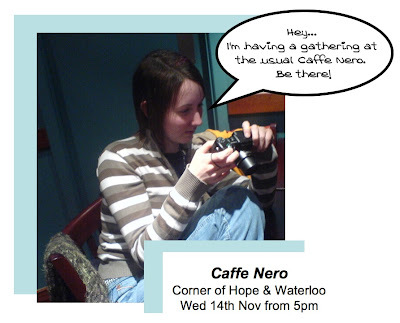 Many thanks go to Laura B for bringing back the gathering... Next Wednesday (14th November) @ 5pm... in the usual Caffe Nero... followed, most likely, with noodles or something. If you can... be there. 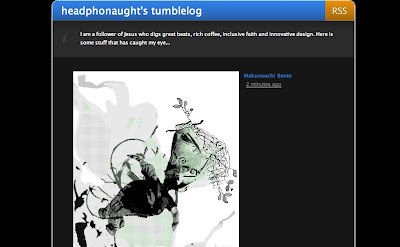 Thanks to Noah Brier for the heads-up on a fab wee web tool/site/space/thingy called tumblr - its a scrapbook space where you can share text/video/pictures/links/videos etc for future reference or for your f&f. I like it because it allows me to share the content I share on Facebook... in a public domain for members of the nanolog community who aren't on Facebook. Its all web2.0 where I can follow other folks... which is a nice feature. You can also change the design [I've got a sweet iPhone thing going on] and embed it in your own webspace if you have the talent. I'm going to play about with it... so follow me / create your own content / get involved. I have created a channel :: Headphonaught's ol' Nanolog Community :: where anyone who wants to... can post content. You need to sign up to tumblr > when you do, let me know and I'll add you to the channel. Been a while since I talked about tunes... and in that time there has been a ton of new stuff released / found / sourced etc. First off... 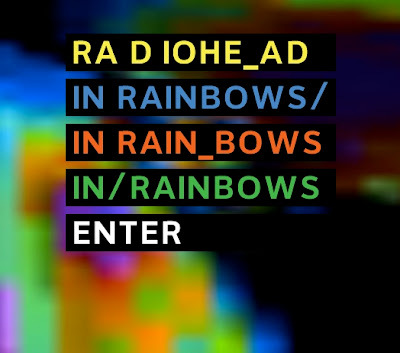 I picked up In Rainbows by Radiohead when the site went live and I have to say... I love it. I have avoided Radiohead for a long time... but thought I'd check them out... and it worked. I'm now a big fan. 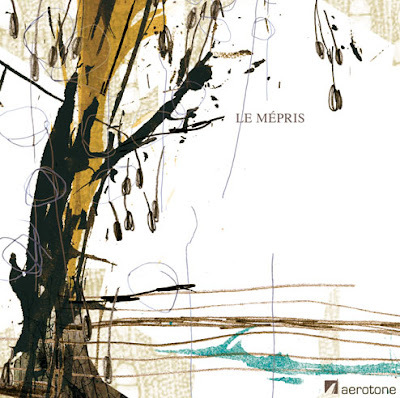 The soundscapes created on the album are refreshingly unique... melding guitars, rock beats and electronic ambience. 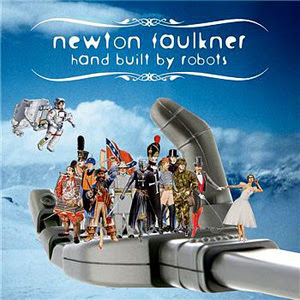 I love this album and intend... on the back of it... to buy up their back catalogue. Their download experiment worked for me... and, in case you are wondering, I downloaded it for free... and intend to buy the album when it is finally released. I used to be a big Bob Dylan but kind of lost him in all the electronica and post-rock nonsense of recent days. I like his voice... and the poetry of his lyrics. He has a number of fab songs to his credit. 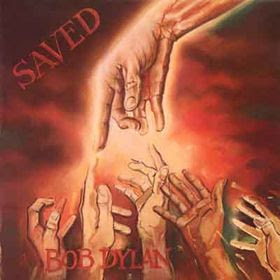 Saved is an unusual album... The second in a trilogy of "Christian" albums that he released in the late 70s and early 80s... between slow train coming and shot of love. I've been broken, shattered like an empty cup. He must have loved me so much to send me someone as fine as you. To stay closer than any friend. Who knows those most secret things of me that are hidden from the world. You know we are strangers in a land we're passing through. I'll always be right by your side, I've got a covenant too. A truly beautiful song... loving in so many ways. 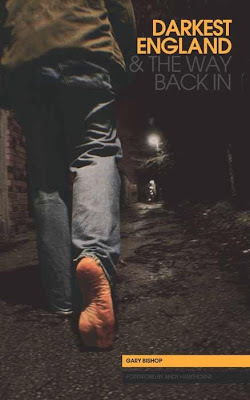 Although I don't get all the evangelical references, I would recommend this album... rock music from a Christian... rather than Christian rock music. Powerful. 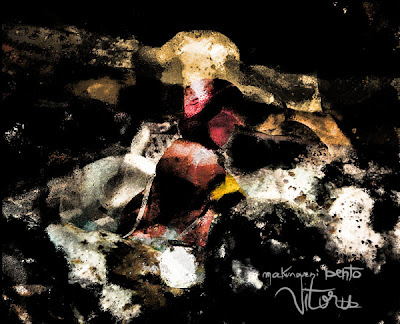 This latest offering from Makunouchi Bento is a special one indeed - interpretation of and sound excursion into a few of their favorite classical compositions by such powerful and original composers as Erik Satie, Anton Arensky, Maurice Ravel., they hold nothing back while adapting them within the Mabento realm. With its twists of melancholy, nostalgia, and even childlike amusement - Trcutu manages to hold onto a genuine historical and aesthetic interest found within some of the originals. At times picking up the melodies and running them through the spontaneity and textural styles of their own; while at others working not just from the originals but the influence and atmosphere felt by listening to them. This experimental ep was made for the Romanian `zine INCEPEM, issue 3 (september) with FUTURE set as the theme. 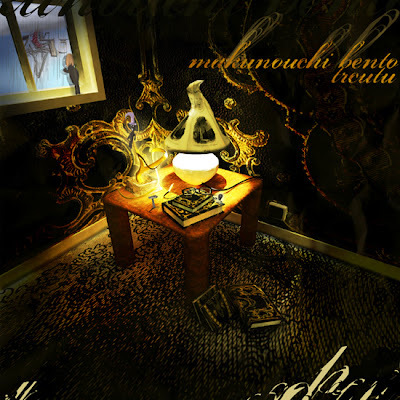 Makunouchi Bento (or mabento for short) developed it following the speculation that digital music technology is increasingly moving forwards with their attempts at recreating analog warmth and real world modeling (instruments, ambience/room, the recreation of previous mediums, etcs). This paradox is approached in a variety of ways here; sometimes through atmosphere, others through tube emulation and so on. Even with this concept in mind the emotive influence on the artist remains and Vitoru posseses the ability to place a listener in a familiar state of being in an unfamiliar surrounding (aside from the humorous and rhythmic opening of "rhybot"). A release from one of my fav netlabels :: Sutemos :: is always a good thing... Their 19th release Intelligent Toys 4 is another awesome compilation of the finest in glitchy ambient electronica and a fine addition to the Toys series. 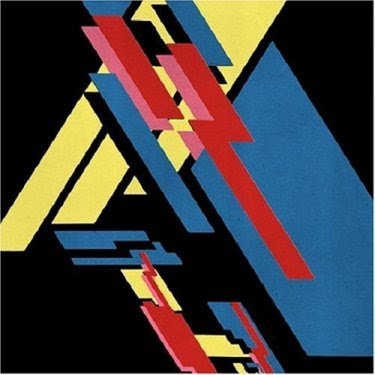 Tracks from the likes of IJO, maps and diagrams, syntaks, and sleepy town manufacture all hit the spot... with a few acoustic guitar moments in there too to provide some new direction and additional flavour. Very, very good! Much has been said before. Much will be left unsaid. It's listening time now. 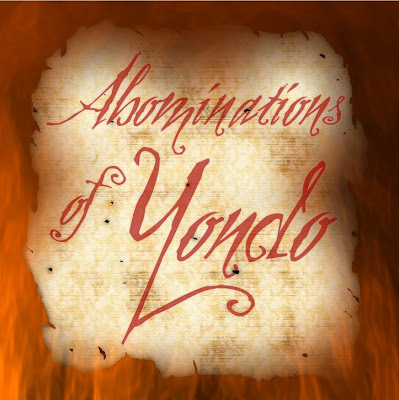 It is listening time... words can only say so much... download it for free and soak it up. What I love about a Sutemos release is the artwork that goes with it... check out the folder within the zip file for some fab graphics. A nice detail. Lastly... while we are on the subject of netlabels... I was honoured to receive a CD-r from Cousin Silas with a number of unreleased tracks and fuller mixes. I am loving it... and I have to say I am excited. He is exploring in Tangerine Dream, Vangelis and Redshift space with bass-driven rhythms and synths... as well as making some of the most engrossing ambient music I have heard for a while. The full version of The first landing (all 30 mins of it) is truly awesome... bring pictures in my mind of a ship landing and the passenger exploring the foreign, alien landscape. I love music that I can contextualise... and this is some of the best. 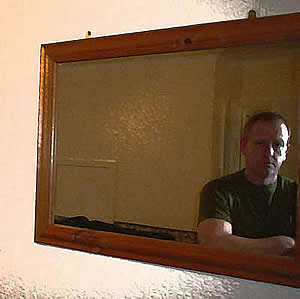 Check out his myspace page for excerpts. Some good music out there... get out there and explore! 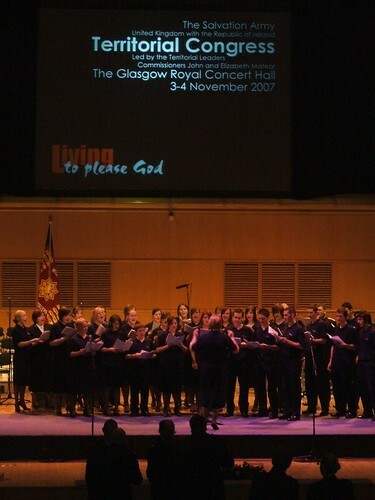 On Saturday and Sunday... the Salvation Army in the UK's annual Congress gathering for 2007 was held in Glasgow. I think it comes to Scotland every 3 years or so... for a London-centric organisation... that's pretty good. I have to be honest... I wasn't really in the right frame of mind for the Congress. I was in a critical "Waldorf and Stadler" kind of mood. 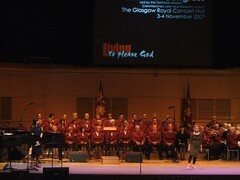 It was possibly because of the state I had seen my wee wifey get herself into because she was singing in the main "celebration" service on the Saturday night. Olly kicked things off with a song that she didn't choose... that was too high for her... and the PA system wasn't working too well. I admire how well she did considering. 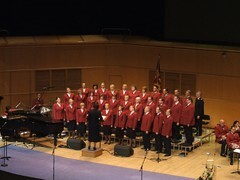 We had the International Staff Songsters (Choir above) for the weekend along with a number of Brass Bands [Sunderland Monkwearmouth Band... Belfast Temple Band... the "A" band from the East and West Summer School] and a "worship" band. I didn't really connect with the worship. Maybe I wasn't in the mood... but worship, for me, is about letting go and giving my all to God through the music and the words. Life is worship... in this sense... but the music wasn't mine. The hymns were great... classics... but I just couldn't get into them because of the music. This saddens me as I recount this. I don't get songster music. Don't get me wrong... I actually enjoy being part of the Songsters in Bellshill... but I don't like the "posh" singing and the jaunty little melodies. They are for others... just as "raise your hands in the air" music is for me. Same too for the Band. For a Brass Band to move me... the tune needs to add something to the song - "How great thou art" comes alive within the Swedish Folk Tune, for example. The music on the Saturday night didn't move me. What or should I say who did move me, however, was the African Gospel Choir (above) because of their freshness... newness... raw honesty of performance... Women singing and dancing their hearts out... to a hypnotic beat from a bass drum. For me it was real... truthful... it wasn't about the music. It wasn't note perfect or "posh"... it had the funk and it stirred me out of my apathy. The Belfast Drama Group also stirred me. They intrigued me and ensnared my attention with their tremendous simplicity. The plays they enacted through the weekend were more valuable to me than any of the thoughts from the leaders. Put it this way... I can still remember the plays! Passionate... inspiring... thought-provoking! They led you to conclusions that weren't initially obvious and made the viewer think... actively think about what they were saying. Awesome. What frustrated me the most... however... were two videos. 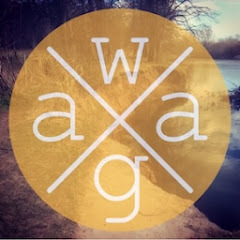 The first was on "War Cry Evangelism" where a lovely, sweet couple now living in Perth recounted a tale of how they came to the Army through a chap selling the War Cry. So much emphasis was placed on the paper and not enough on the loving, missional nature of the chap selling the paper or the folk in the Corps who welcomed them to the Army. It was such a plug for the War Cry... it was embarrassing. I would argue that it was the love shown and not the paper that brought the people to the Army but hey... you can't sell love... can you? 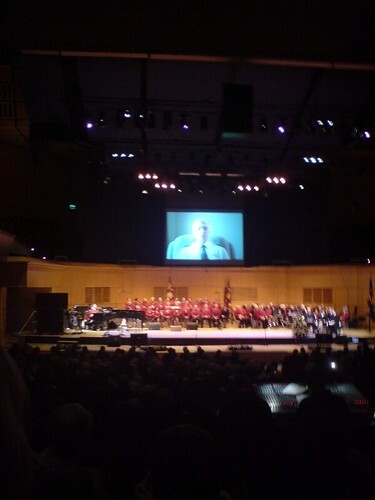 The second video was from "the William Booth Training College" and it was all about the work Corps Officers do. Heart to God, Hand to man... etc etc. Backed by the U2 song "all because of you" it explored the work of Corps and Social Services Officers. It was a blatant promo video for Officership. I know they have to plug it but it was made worse by Commissioner Keith Banks leading the congregation in a time of prayer for Officers, Candidates and those "called" to Officership... without bringing the laity to the Lord. Me and mine pan our guts out. I don't want thanks but I would appreciate being recognised and prayed for! The Army is a movement that believes in the Priesthood of ALL believers... not just those with badges! I am sorry if this offends anyone but I was deeply offended myself. I am not called for Officership... but does that mean my calling is any less important or worthwhile..? I think not! When the Territorial Commander took to the platform... I wasn't really inspired... and I when he sat back down... I wasn't really inspired. He talked, at length, about faith. Something in what he said jarred with me... Faith is extremely important, don't get me wrong, but it is subservient to love. Faith can become rigid... it becomes something you either have or don't... and if you do... you might not share or have commonality. Love, on the other hand, is flexible... it adapts... it creates... Are we not commanded to love God and love our neighbour? Not have faith in God and in our neighbour. Maybe I am clutching at straws here... but there was little love mentioned... and tons about faith. I can have all the faith in the world... but if I don't have love... well I'm pretty worthless. 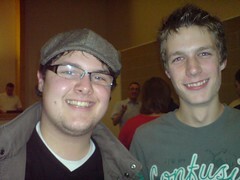 I did enjoy the fellowship... sitting with Jon G as Olly was with Janey. I loved meeting all my pals... (30 something Facebook friends were hugged) and being part of something. But, the nagging question reverberated around my skull, what was I part of? I hung around with Jon to see [dweeb] play a set. I was the lift for Al and Lauren. 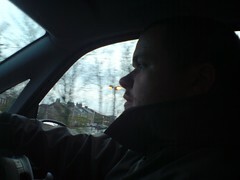 I listened to about 3 songs before I headed out with Jon to KFC for food and a blether. Loud wasn't for me. Sunday was meant to be different... I tried to get out of the funk I was in... and be more positive. 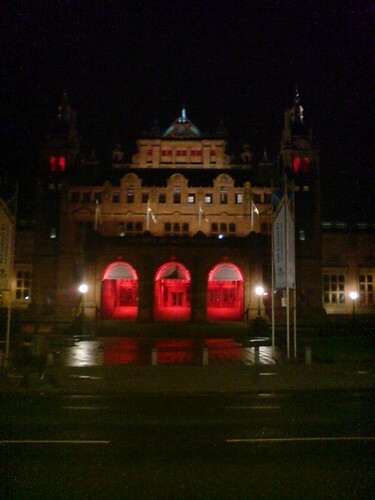 That lasted for a while until I watched some Army bureaucrat ask a member of the Royal Concert Hall staff to throw out some chap [he did look suspicious] because he didn't have a ticket and he was hanging about the Market Place. This infuriated me. WWWD? What Would William Do? I doubt he would have thrown him out... oh and don't get me started on what the Lord would have done. 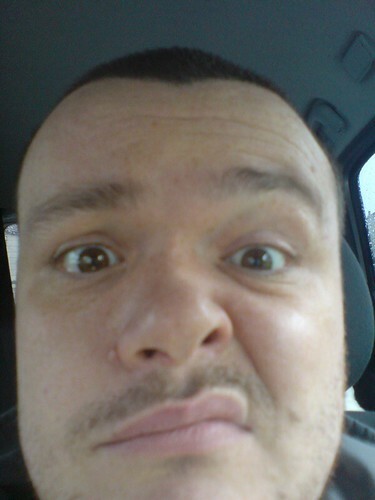 I sat with Jon G and Gordy from Motherwell... and tried to engage with the content. The "A" Chorus and the "A" Band from Summer School were awesome... I connected with their music. Although I did share Jon's wonder as to where the Drama Group were from Summer School. The Belfast Drama Group were on point with a prayer focus entitled "Help, I'm too busy to pray"... and Capt. Stephen Poxon was eloquent with his thoughts on the intercessors' work in praying for the event. The TC spoke about being not conformed to this world but transformed by the renewing of our minds. What he said was meaningful. I just thought it was ironic considering the grandiose nature of the venue and the ticket prices and the whole "hierarchy" of events. There was a long response time... a response time that was timed and planned... during which I had to leave to pick up Dayna and Miriam who were at a fringe event for kids. They had a ball... thanks to Richard Knot, Kevin Avis and a ton of other folks. While I was squeezing passed folk in the row... I was "blessed" as if I was a seeker heading to the Mercy Seat... which I thought was funny and sweet. Afterwards, we grabbed lunch in "The Filling Station" - their service was so slow that Olly had to leave half way through her veggie lasagne. Good to see Becky there. We headed back for a musical interlude where the "A" Chorus and the "A" Band from Summer School played a short set each. They were very good. We got kicked out at 3pm and headed to Starbucks with Janey and Roscoe. Its always good to have coffee with them! We headed back for 4pm where I got to sit with Olly for the first time all weekend. The African Gospel Choir and the Belfast Drama Group were... again... the highlights for me. The music... other than the brief worship set the Essential Band did... was pretty much the same as before. We left at 4:45pm and I was glad to. This isn't my kind of gathering... Roots is more my thing. Too much pomp and ceremony for my liking. I did not appreciate paying about £26 for the two days for me and mine... and then get asked for an offering on the Sunday morning. I gave my offering in another way on Sunday. If you can't afford the venue... don't go there! Get out of thinking it has to be fancy... it doesn't. People come for the people... regardless of who we have on the bill. I couldn't connect with the worship, at times, and was scunnered by the whole perpetuation of the clergy/laity split. I did, however, gain a blessing from the African Gospel Choir, the Belfast Drama Group and all my people who took part from the Summer School. I also loved seeing all my pals... the fellowship made it for me! If you were there... what did you think of the events? 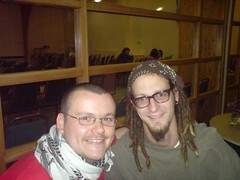 Shane Claiborne from the simple way community in Philly was quite simply awesome on Wednesday night... and I wanted to capture my notes in one place. I stress that these are my notes and not necessarily direct quotes. ...and challenged everyone by encouraging us to make poverty personal. He dismissed the use of this verse with the nonsense known as prosperity theology and asked the gathering how many friends we had on the margins... Honestly, I think I have one. "We loved you so much that we were delighted to share with you not only the gospel of God but our lives as well, because you had become so dear to us." Its about giving our lives as much as it is about giving our money... reminds me of the Derek Webb song Rich Young Ruler. Check it out. Over to Shane. He had the most infectious laugh and sweetest deep south drawl... y'all!!! Bang on... to me. We have a terrible image crisis thing going on... where we are classed as BIGOTS instead of being known for LOVE, GRACE and COMMUNITY. Shane spoke of his time growing up in the deep south. He spoke of his perception of the church where they were obsessed with making believers... but weren't good/interesting in making disciples / followers. "...if I have a faith that can move mountains, but have not love, I am nothing." Christians should be known for doing what Jesus did... instead of the bigotry/hypocrisy/judgementalism that they are. He then spoke of how we ARE born again... but we are born into an extremely dysfunctional family. "All the believers were together and had everything in common. Selling their possessions and goods, they gave to anyone as he had need." 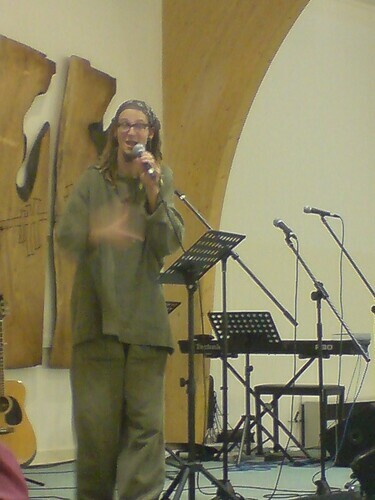 Shane then went on to tell his story... referencing the above verse... emphasizing that there weren't any needy people. He spoke of community... and said that community... in some way... is surrounding yourself with people you want to be... so that a small part of them rubs off on you. Interesting perspective. He then discussed the kingdom of God being down here as well as being up there... Jesus teaches us how to live in the here and now... belief is not just for when we die. This isn't a Left Behind novel. To live for the kingdom of God on Earth we must resist the principalities and powers (ie the Government and bureaucracy etc) with courage and imagination - we serve a King who rules with a towel not a sword. Upside down and awesome! Shane called us to be relevant but peculiar - this touched a chord with me. We need to be relevant and in the world... but we need to stand out in our peculiarness because we are not of this world and do not conform to its customs and ways of thinking. He then challenged the gathering by saying that we shouldn't wait for the Government to do what the church is MEANT to be. Extreme times give birth to extremists. We need to be known... not as extremists for hatred... but extremists of love! Wow..! Truly awesome... and inspirational. 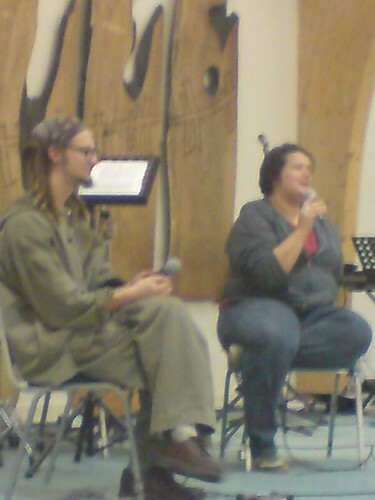 He spoke some more with the FAB Brooke, from the Simple Way, in a Q&A session. One thing I picked up on was that every member of the community worked part-time so they could be present with their neighbours in Kensington... the poorest neighbourhood in Philadelphia. Kudos to Shane and Brooke for being heroes of our age... and showing simply that their is another way. That Christians aren't all anti-gay, hypocritical and judgemental... but have love, grace and can demonstrate true community. Go Shane! Go Brooke! We need more people like you. Been busy since I last posted on the ol' nanolog. Have you missed me? Don't worry... 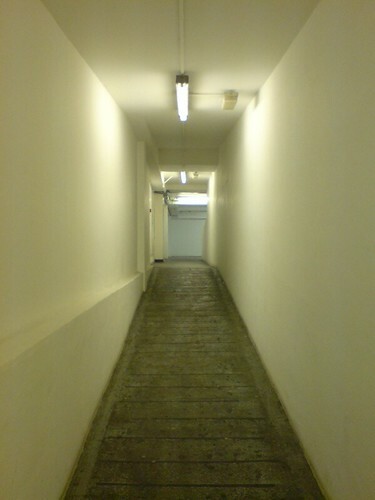 I'll never abandon this fab cul-de-sac of thought and image in the great 'tinterweb. Been working hard over the last few days in my day job... got a deadline for tomorrow that I've nearly met already... I hope! On Monday night I worked on for a while... Olly was coming into Glasgow for an "A" chorus practice... and I decided to join her. 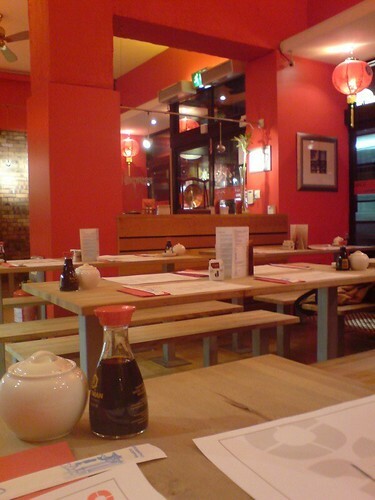 I grabbed some fab Japanese food with my project lead, Mike, while I was waiting for Olly. They do nice maki sushi... vegetable tempura and prawns... gyosa... Lovely. Something I should have done a while back... OKO has been open for a while and my lead has been commuting to Glasgow for ages too. 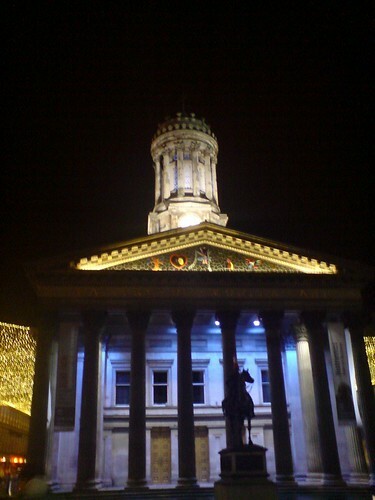 I traveled with Olly to Glasgow City Centre... dropped her off and headed to the Beanscene across from the Kelvingrove Museum for a four-shot latte and some time to prepare for a prayer event in Glasgow tomorrow. Olly was asked some time ago to prepare 6 prayer stations for a pre-Congress Prayer event in Glasgow. Long story short... I picked up the task and took time out with a coffee to prepare. 6 prayer stations :: Adult & Family... Children... Youth... Social Services... Emergency Services... and... Human Trafficking. My role is to get people thinking a nifty little approach called lectio divina aka divine reading aka read... think... pray... live! I used the getting-away-from-it time to write the content. Worked. If you want to read them... just let me know. Tuesday was spent meeting and moving things on. 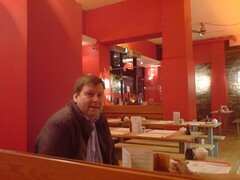 Met up with Iain Stewart and Paul Clement in wagamama for a ((deep)) debrief. We've received a ton of positive feedback... A lot of people got it and its made an impact. Nice. At 5pm I met up with Michael "Ninja" Jessop to debrief him on the Prayer Stations and the way I thought they could be shaped. He knows people and got on the phone and made the connections that should deliver on Friday. He's a great guy and I hope to work with him again soon. I finished the content late on Tuesday night. Spent some sweet time with Olly too. Knackered but a good knackered. 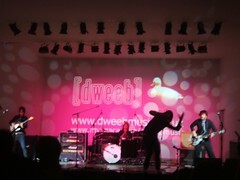 Wednesday night was awesome! 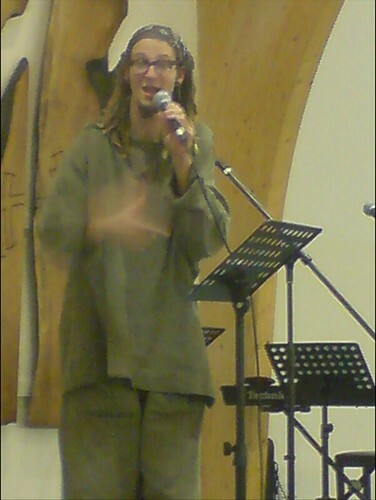 I headed over to the Bishopbriggs Community Church to hear Shane Claiborne and Brooke from the Simple Way talk about their irresistible revolution. What was said deserves a post on its own. 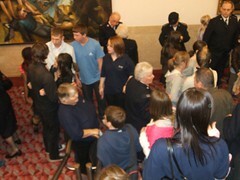 I was delighted at the turn-out from my tribe... Jon & Lorna... Gordon... the gang from Easterhouse... Paul & Jen... The Billard Bros... Nice! Shane was awesome [for some reason I keep saying awesome but its appropriate for Shane] and extremely funny. He is lovely, genuine and down-to-earth. We need more people like him. 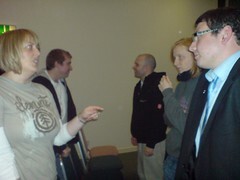 Brooke, from the Simple Way community, was there with Shane to keep things right and was so lovely and sweet. I got a chance to speak to her at the end... and she was so nice. She said she hated by "puppies" tee but did it is such a lovely way. Its not everyday you meet one of your heroes but tonight was one of those nights. Thanks go to Paul Ede from Urban Expression for making this happen. He emailed Shane and the rest is history. Paul uses a pic of mine for his slides etc... getting Shane over was payment in full :-) Cheers Paul! It was also sweet to see Paul's wife / better half... Esther... and Andrew Grinnell too from alove. Today... 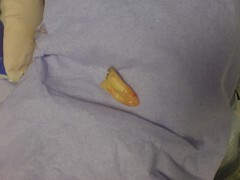 I got this bad boy remove from my upper right side of my mouth. It was smashed up and beyond fixing... well... fixing within my budget. Hence why my face is all numbed up in the pic at the top of this post. Been a great few days... God is good!